Since 2010 Slow Food has been creating a network of gardens to save Africa’s extraordinary biodiversity. 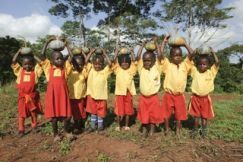 Our dream: creating 10,000 gardens in African schools and villages with the aim of guaranteeing Good, Clean and Fair food for communities and making them aware of the value of their lands. We also aim to raise both citizens’ and politicians’ awareness of important political campaigns (GMOs, land grabbing, the devastating impact of mono-cultures, sustainable fishing), by training a network of leaders who can serve as protagonists for change and the continent’s future. The gardens bring together and value the capacities of all the community members uniting different generations and social groups (village and school associations, local administrators or non profit organisations). They recover the wisdom of older generations, make the most of energy and creativity of younger people, and benefit from the skills of experts. Before planting a garden, it is necessary to learn to observe and to get to know the terrain, local varieties and water sources. The garden must be adapted to its surroundings, and local materials should be used to make the fencing, compost bins and nurseries. By looking creatively at the space available, it is possible to find somewhere to put a food garden in the most unlikely places: on a roof, by the side of a footpath and so on. Slow Food gardens are places for local biodiversity, which has adapted to the climate and terrain thanks to human selection. These nutritious and hardy varieties do not need chemical fertilizers and pesticides. The gardens are also planted with medicinal plants, culinary herbs, and fruits trees (bananas, mangos, citrus). Seeds are selected and reproduced by the communities. This means that every year the plants become stronger and better suited to the local area, and money does not need to be spent on buying packets of seeds. Natural remedies based on herbs, flowers or ash are used to combat harmful insects or diseases. Once again, an approach based on observation and creativity is fundamental. Sometimes it only takes a gutter, tank or cistern to collect rainwater to resolve seemingly insurmountable problems and avoid more expensive solutions. Food gardens offer an excellent opportunity for teaching adults and children alike about native plant varieties, promoting a healthy and varied diet, explaining how to avoid using chemicals and giving value to the craft of farmers. Food gardens are a simple and inexpensive way of providing healthy and nutritious food. But even in the most remote villages and the poorest schools, Slow Food gardens are also a place for games, celebrations and fun. Neighbouring gardens exchange seeds, while those further away exchange ideas and information. The coordinators meet, write to each other and collaborate. 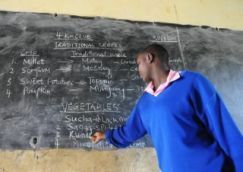 School gardens in Western countries are raising funds for the African gardens.